I have always been amazed by those who claim their faith is strong without the church. The truth is every Christian needs the church. I have been a Christian for over thirty years. Spent decades in the academy and in the pastorate and I have wrestled with this very subject for a very long time now.. This argument as to whether or not a person can be a Christian without going to church is based on a deeply flawed presupposition as well as an anemic biblical theology ( the predictable Hebrews proof text provided without any reference to the grand polemic of that amazing letter, namely, the identity of Jesus Christ) . There is a certain habit of thought, which functions as a “reality distortion field.” It is the all too common error in our view of causation, one where the imperative preceeds the indicative. With all due respect to yourself and to Tim Keller, who I deeply admire, the argument presented here, the unassailable, “biblical an obedient” is overreaching on so many levels. This abstract argument for “church attendance” reads like a grasp at control, controlling outcomes through coercion. It is this “clerical” instinct, which creates the “distortion” where we fail to consider what is lost when we continue to sacrifice the indicative (you are) on the altar of the imperative (you ought)! Might I suggest that we consider this issue in light of your recent, wonderful post? “What to call a Christian”, which is quite literally one of the very best things that I have ever read in any blog post! What you have there is not one important issue among many, but rather, the fountain and foundation of our faith. This is the only hermeneutic by which we ought to be evaluating every one of our doctrinal concerns! Thanks! We’re reaping the dividend of decades and generations: Church is not place or building. We are Church. I think this is very true, and you’re right about much of Church as building or cultural-establishment are reaping the rotten fruits of many leaving. Paul is pretty clear that the Church is the whole of believers. Yet Paul also talks of ‘officers’ (lack of a better word) who lead the church, in the role of deacons/deaconesses and elders (and/or) bishops. These are also a part of the organic conception of the Church as the People of God. And besides thing belongs the meeting together for the sake of the eucharist, prayer, friendship, and hearing the Word. This is our corporate worship. And as Derek put it, if we’re not worshiping in this way, we’re worshiping something else. I guess my biggest beef roots itself in the turn-of-phrase ‘butts back in the pew’. I know you’re not weighing your post on this phrase, or mean much by it besides getting people back together. 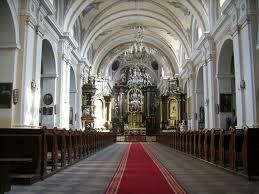 But it reinforces, typified in ‘pew’, the culture-establishment form of church. It will form the same rotted structure. We ought to be able to say, with Cyprian, that there is no salvation outside of the Church, or, with Augustine, one cannot have God as Father without Church as Mother. But these don’t mean the clericalism of Rome or any kind of denominational sectarianism. Church ought to be a living term, the exiled people of God, an alternative ‘polis’. Eyes might open up if Christians realized, in gathering, they are heralding the Lord of lords, the Head of His people, and the Judge of the world. I keep working with the distinction between church as “non-for profit institution” and Church as the people of God surrounded around the Word and Sacraments. When churches are dying or when we want more people at church, it feels like it is the non-for profit institution we are clinging too and not what it means to be church. The rest of the stuff, from buildings committee, programs, etc are all the outward manifestations of how the Church decides to be church. But what if we simplify, like those christians that can only meet underground. What if we lose some of the trappings of church and go to the heart of making disciples who are around the word and sacraments, what would that look like today in our Western culture? As a (newish) Episcopalian, I love that you included the Lord’s Supper. 🙂 Sometimes it’s a struggle for me to do church, but the sacraments – more than anything – remind me that I can’t be Christian on my own. Me too. I’m a Lutheran. Me too, and I’m a Presbyterian (PCA). I’ve dealt with this issue before, but this is such a good treatment of it that I feel I have to pass it on to you! Great post. I particularly like the “Youth group” understanding of justification by faith. Thanks for this post. As a Reformed Christian who has made my confession according to the Three Forms of Unity, it is against my own confession (Belgic Confession, Article 28) to argue that I can live a godly life separate from the church. The Belgic Confession reminds us that we are ‘duty bound’ to attend church because we are members of the same body and we ought to be serving one another. It’s really tough to serve each other if we are consistently absent. This seems to be basic to the summary of the second table of the Law–to love my neighbor as myself. Another way to put it would be that my absence at my church is unloving and hurtful to my closest neighbors–the household of God. The problem is that the idea of ‘duty bound’ isn’t well understood in a Christian culture of cheap grace. That is another excellent way of putting it. Thank you, Carol. As a PK I’ve heard my dad talk about people who believe in Christianity life without church quite a bit. His questin is always , “So what if you *can* be a Christian without the church? Why would you want to?” For him lack of desire to be with God’s people said much more than lack of conviction . Boom. Sounds like a good pastor. Good post, I would love to see you write one on the beauty of the church because…well I love my church so much and being a part of it has made me a much stronger Christian than I ever could have been on my own or even just showing up for 90 minutes on Sunday morning. I hated the idea of being involved in a small group. I don’t like people. I don’t like being open with them. I hate praying publicly. Hate it so much. Small groups sounded like my version of hell. But I have a lot of respect for my pastors and they were so gung-ho about the groups that I joined one anyway and seriously – it has made all the difference. But, I also appreciated that you did make a small allowance for circumstances. My fiance has a ridiculous job that makes it impossible for him to attend church in any sort of regular fashion. He’s working towards a solution, but for now it’s a rough situation and not one he’s pleased to find himself in. I think an earlier version of myself wouldn’t have had any patience with that, but I see it a little differently at this point. I like your posts – they confront “cultural christianity” (as if a person can conform to the demands of today’s American culture and still be a follower of Christ). I have one further point I think is vital to your argument: If we are not genuinely involved with a local body of believers (warts and all) it’s impossible to be a part of fulfilling loving one another (John 13:34 and 35) let alone be included in Jesus’ high priestly prayer. That’s an absolutely essential point I try to make to my students regularly. Thanks for the comment. Nice piece of work, but I question the assumption: ‘going to church’. I think you too easily combine the Biblical verses with the reality of today. It is really questionable if Scripture tells us something about ‘going to church’. It tells us a lot about ‘being a church’. Is is absolutelly true that we are called to community and obedience. But this cab happen in all kinds of contexts. Personally, we try to live it out in a living community, to be church for 168 hours a week and not just during ‘attendance hours’. In this era of individualism we probably have to dig deeper to solve the undeniable problems of individualism and self-centeredness. One quick thing. I get that there is a modern context issue. Still, the New Testament texts do talk about gathering together for the specific acts of worship, teaching, sharing the Lord’s Supper. We know historically that was something that happened in the early church/churches in the New Testament era on Sundays in celebration of the resurrection and so forth. There’s nothing I’m saying that denies the reality of all of life worship, or the principle that we are the church. But the fact that we are the church doesn’t mean for an instant that we are not also to “gather as the church.” Now, of course, that doesn’t have to happen in a special building or something. Houses can work too. Still, the same basic activity is something that is prescribed. I guess what I’m doing is pushing back on the extreme that the “we are the church, we don’t just go to church” theology has been pushed to. Again, thanks for swinging by! The point is very simple. In the Bible, Christians are commanded to submit and listen to the elders and deacons (pastors, etc) whose job it is to guide, guard, and love them. Well, if you’re not a member of a church that has those leaders, you can’t very well submit to them now can you? The church is meant to glorify God and encourage believers because it is the church of the living God, the pillar and ground of the truth. Too often, “church” is an excuse, by the leadership, to deceive and abuse those who innocently just love the Savior Jesus Christ and love other believers, and are seeking to be obedient to His Word to assemble with other believers and be under the guidance of godly leadership. There are so many churches here in America, but that doesn’t mean that they are faithful to God and to the Scriptures and are there for the sole purpose of glorifying the Savior Jesus Christ and building up His body by the sound preaching and teaching of His Word, the Bible. Too often they are there to promote man-made doctrines and make merchandise of God’s people, bringing swift judgment upon themselves. God’s Word commands us to turn away from those who are such. If people are too busy, or tired to attend “church” maybe this is God’s judgment upon a disloyal “Christian leadership” who are more interested in promoting themselves and their brand of “Christianity” than in just loving Jesus Christ, loving God’s Word and loving believers. Derek- my question was sorta but not fully answered in your conclusion….that you didn’t deal with membership but more the value of the local church. Why cant the things you mentioned be accomplished outside of formal membership? Connected to a small group, actively connected to the worship gathering, hearing from the word serving in the church….taking communion, being baptized… submit to leaders, challenging other people who treasure christ to pursue him more through appropriate church discipline. I didnt hear the argument for the existence of formal church membership rather for the local church and I love the local church….I click the other article you wrote and wasn’t quite convinced either…it seemed like those can exist without formal membership as well. outside of voting on the budget what is the good of formal church membership? And don’t get me wrong….there is a budget that needs to get affirmed, but anything else seems to be a stretch. I think the benefits of church membership are important for some but what people have experienced will vary. I have been in one church or another most of my life and my experiences have primarily been negative, especially with so-called leaders. Descriptions that come to mind include sexual misconduct, liars, financial mismanagement, power-hungry, judgmental, manipulative, condescending, lazy, greedy – you name it, I have seen it in a number of churches. Unfortunately, I all too often found virtually no spiritual discernment among church leaders and submitting to their authority was not in the cards for me. In short, I did not see God in so many of the churches attended. Paul wrote in a time critical for the church, a time when the church was fighting to survive. Under those conditions, perhaps it was important to gather despite “serious flaws.” But to say one is not an obedient Christian, a sinner and one not striving to love Jesus if they are not a member of a church fails to recognize the many worship options that exist in today’s world and smacks of organized religion trying to perpetuate itself and survive. The gathering of believers is important and religious instruction is important, but it does not have to happen in the context of church membership. To use a situation described above, I am much more likely to find God in an underground gathering of Christians than in an air-conditioned sanctuary filled with people going through the motions.